In the food processor, make a paste of onion, chili powder, turmeric, ginger and garlic. Fry the paste 3 minutes; add the chicken and fry 5 minutes more. Add the rest of the ingredients and cook for 40 minutes. Take out the chicken, puree the soup, cut the chicken smaller and put it back. 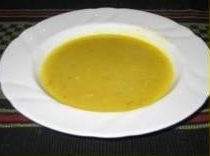 Mulligatawny in Tamil language means "pepper water" even though the soup is not peppery at all. I would call this dish a historical/colonial mixture of British chicken soup and Indian spices. Mix all the ingredients and beat for a minute. Make very small pancakes (best in a special pan), turn them around after half a minute. Sprinkle powder sugar on top. Poffertjes are very small Dutch pancakes and they are baked in a special frying pan. You can also use a mixture of wheat flour and buckwheat flour.